From capitol to campus, sparkling lakes to rolling landscapes and innovative work to weekend fun, Madison is known for the people, places and things to do that create its unique culture. 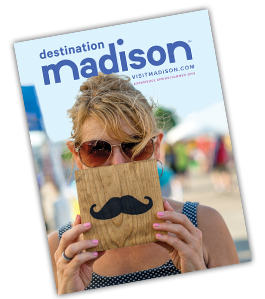 You can read about our accolades, but the best way to experience Madison is like a local! Madison is the perfect place to visit if you love to dine! Our farm-to-table heritage means restaurants such as Graze and Harvest deliver menus that are local, seasonal and delicious. You can also taste-test your way through traditional Wisconsin fare in tavern-style settings like The Old Fashioned Tavern & Restaurant. More restaurant ideas. The Greater Madison area is a mecca for microbreweries, wineries and distilleries. Stop in to sample a brew and take a tour at Wisconsin Brewing Company, or try a specialty cocktail at Old Sugar Distillery, which also offers free tours and tastings. Many visitors make a day of it and take the scenic drive to Botham Vineyards & Winery to taste their award-winning vine-to-bottle wine tasting in the tasting room, open March – December. More about our craft culture. Don&apos;t miss neighborhood destinations that offer block after colorful block of shopping experiences. State Street is a popular pedestrian mall that is home to unique shops such as Little Luxuries, The Soap Opera and Tailgate Clothing. On Monroe Street, explore both floors of gifts and kitchen gadgets at Orange Tree Imports, voted "Best of Madison" for more than 20 years. And on the westside, you won&apos;t want to miss Hilldale Mall, home to stores like Sur La Table kitchen shop, Kate Spade and Michael Kors. If your tastes trend toward antiques, you&apos;ll find more than 28,000 square feet of furniture, collectibles and art at Odana Antiques, also on Madison&apos;s westside. More shopping ideas. Madison is known for its vibrant urban scene, but there&apos;s so much for outdoor lovers to do, too! Our locals love the area for seasonal fun, from sailing and stand-up paddle boarding to skiing and snowshoeing. Our biking and hiking, lakes and sports and recreation pages have endless ideas for outdoor fun. When the day is done, stay at one of our local hotels or bed and breakfasts! Some feature unique tributes to Madison, such as Graduate Madison&apos;s University of Wisconsin decorated lobby and rooms. Others are locally-owned, like The Buckingham Inn and The Livingston Inn, both bed and breakfasts near downtown Madison. A complete listing is available on our accommodations page. Explore the legendary State Street, a central artery and shopping district in Madison. Explore the pedestrian mall as a local guide illuminates the street’s rich history. Sample the eclectic shops and sample local products. Dive into the life of a local with a Stroll Down State.